I have always maintained that tablets are great devices for content consumption, gaming and multimedia. Sure, you can get a little work done on them, but they don’t have what it takes to replace your laptop or Windows 10 powered 2-in-1. With the launch of the Surface Pro and other devices that mimic the form factor of a tablet but give you a full-blown Windows experience, does it still make sense to pick up a device that’s targeted at content consumption more than productivity? Well, if you are one that will use the tablet to consume content, play games and maybe work a bit on MS office like apps, then the answer is yes. Is the Galaxy Tab S3 the one for you? Well, read on and find out. In the world of tablets, Apple has taken the iOS 11 approach to make the iPad more multitasking friendly and in our initial experience, the initiative looks promising. However, today we have with us the Samsung Galaxy Tab S3 that boasts of the S-Pen, Some interesting features and Android under the hood. It’s a little disappointing to see the device run on the Snapdragon 820 in a day and age where premium devices are running on the 835. 4GB RAM is more than enough for an Android tablet to get the job done. Place the Galaxy S2 and the Galaxy S8 side-by-side and you will see how far Samsung has come with the design of its smartphones. Following the same design philosophy, we have the Galaxy tab S3. 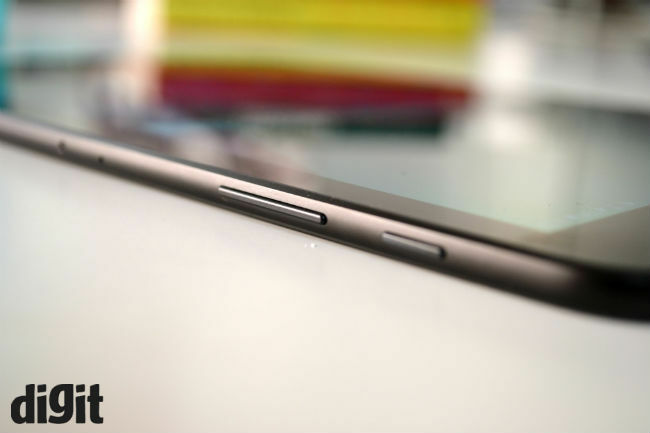 The tablet is extremely slim, and only 6mm thick. To put things into perspective, the iPad Pro (9.7 and 10.5-inch variant’s) is 6.1mm slim. The Galaxy Tab S3 has a glass front and a glass back. The device is available in white and black colour variants. We got the black variant, which looks premium. There is no mention of glass protection on the tablet, but in all the time we used it, we didn’t encounter any major scratches on the device. We were careful not to drop it. The 9.7-inch form factor is a tried-and-tested one (by the iPad for so many years) so as far as ergonomics are concerned, you will feel right at home. If you have used the HTC manufactured Nexus 9, this will feel slightly bigger, but still ergonomic. When playing games or watching videos, the device is comfortable to be used. It doesn’t come with a cover or the keyboard case in the box. That’s true for the iPad Pro as well, and is a bummer. I wish the keyboard accessory was part of the package. If not the keyboard, atleast a cover that doubles up as a stand, something like the iPad smart cover. Moving to port placement, (holding the tablet in portrait mode) you have the power button and volume rocker on the right, the keyboard dock connects to the left, and the headphones jack and USB-C port are at the bottom. The top and bottom of the tablet has the speaker setup (2 + 2), same as the iPad Pro. 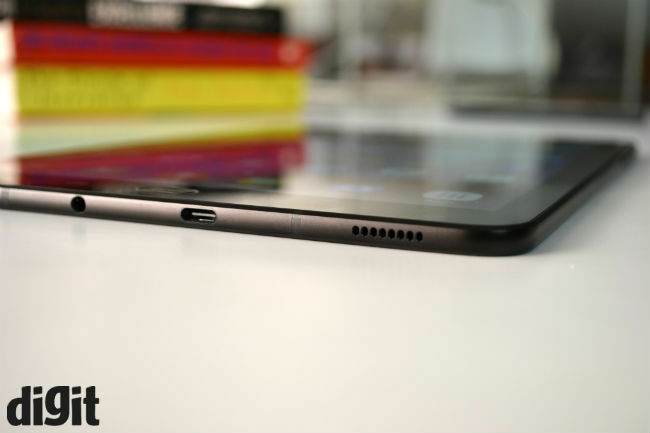 Coming to the placement of the USB-C Port, it is off-center below the back button. In all my time with tablets and smartphones I have found the placement of the USB port under the home button to be very convenient. This off-center position is new and getting the USB cable in requires you to pay a little attention till you get used to its new location. This is a very small deal in the larger picture, but it is something that will stand out to most people. 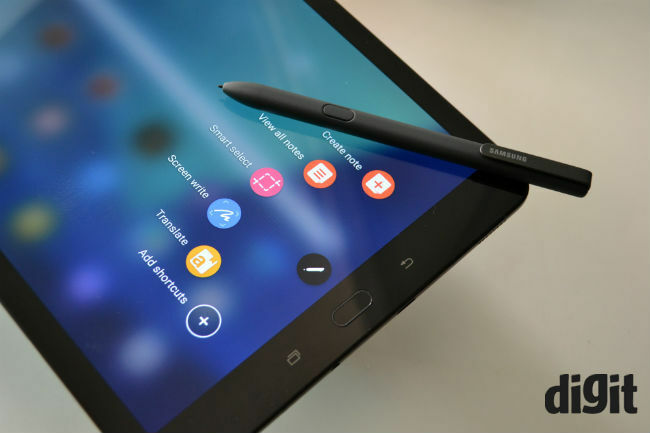 The tablet also comes with the S-Pen, but unlike Samsung’s Note family of devices, there is no place to house the S-Pen. This is a problem with the iPad too. Like the Surface Pro 4, I wish there was a way you could magnetically connect the pen to the tablet. Overall, the build of the tablet is as good as Samsung’s flagship smartphones, which is brilliant. The tablet is slim and without investing in a case to prop it up at an angle, typing in landscape mode is touch. 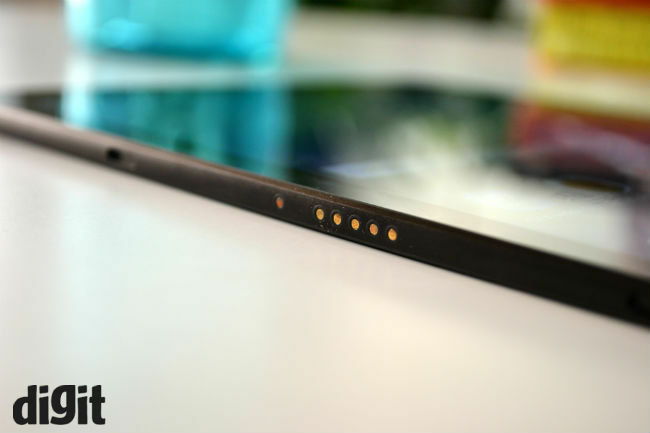 The device is extremely slim and feels delicate because of the glass back. The size is good enough for playing games or watching videos, and I didn’t face any issues watching videos on the device while keeping it on my lap in a cab ride so ergonomically, it’s as good as last year’s 9.7-inch iPad Pro if not better. As we’ve mentioned, the Samsung Galaxy Tab S3 has a 9.7-inch Super AMOLED display, with a 1536x2048 pixel resolution. We played a bunch of YouTube videos on the device and they ran flawlessly. Thanks to Samsung’s Super AMOLED display, Spiderman’s outfit in the homecoming trailer looked really good. The red and blue looked vibrant in the trailer and the greens of the trees were subtle, yet noticeable in the night sequences. The trailer looked better here, than on the 9.7-inch iPad Pro. We tried using the display under direct sunlight. When it comes to everyday tasks like reading emails, reading a book, playing games or browsing the Internet, the display worked well. It was reflective, but nothing that can't be taken care off by moving it around a bit. Night sequences in videos will be slightly difficult to view under direct sunlight, but overall the experience is really good. It is better than last year’s 9.7-inch iPad Pro. We haven’t tested this year’s 10.5-inch iPad Pro yet, so we can’t compare it with that just yet. 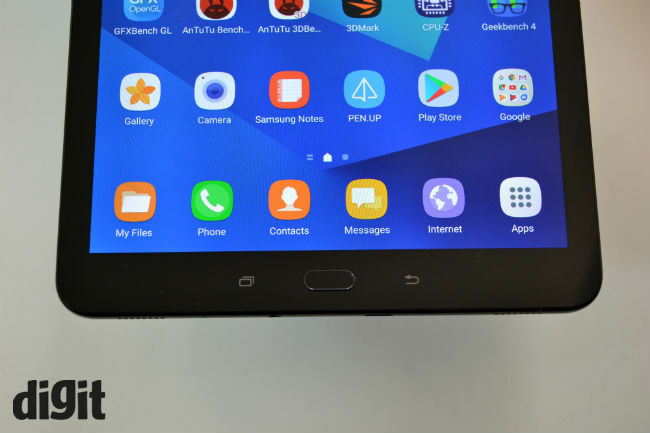 Coming to the audio, just like the iPad Pro, the Samsung Galaxy Tab S3 has four speakers – two on the top and two at the bottom. 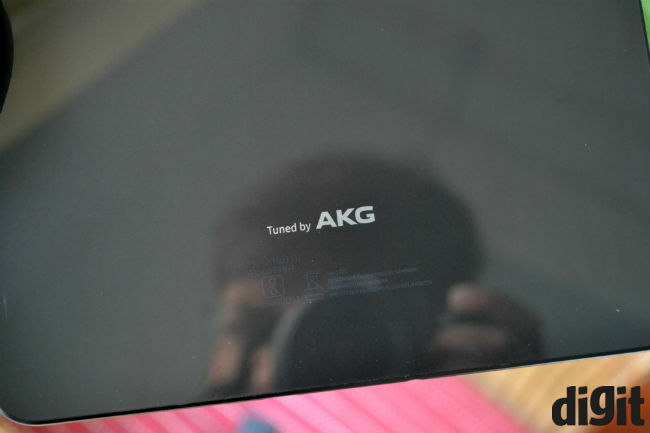 The speakers are powered by AKG, and are disappointing. On their own, without comparing it with competition, the speakers sound decent. They lack bass, are quite loud and only just get the job done. The audio is loud enough to entertain a group of people huddled around the tablet. Play the same content on the iPad Pro 9.7-inch and you will notice the difference. The audio from the speaker of the iPad Pro is clearer and richer. 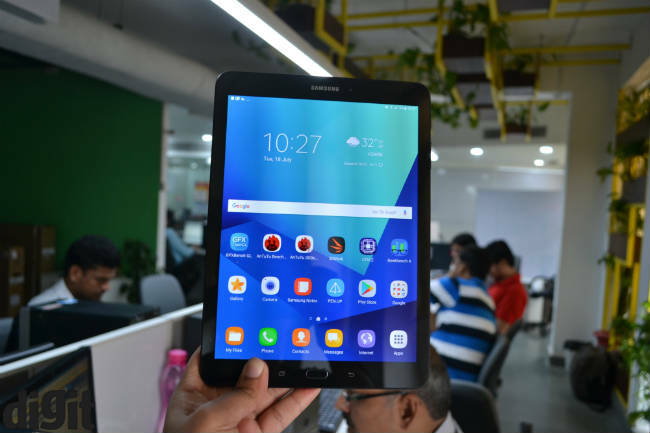 You do have the ability to tune the speakers of the Samsung Galaxy Tab S3 and if you are an audiophile, you may be able to exploit this feature to the fullest. Put on headphones however and the audio experience is rich – nothing to complain about here. Overall, the Samsung Galaxy Tab S3 has a fantastic display, but isn’t complimented with the perfect speakers. When it comes to everyday performance, like checking mail, browsing the Internet, watching videos, etc. the tablet performed impressively with the occasional stutter here and there. It's decent at multitasking as well. Although, I faced some random crashes when using apps like Chrome and MS Word in split screen mode. It’s nice to have the ability to run 2 apps at the same time to get things done, making it a simple task like copy pasting, sharing screenshots, etc. easier. Coming to the typing experience, there is a keyboard dock that’s very similar to the one available for the iPad Pro, but unfortunately we haven’t received that for review. Coming to the camera, I doubt most people will use it to click pictures. It's more for video calling and showing people your house. 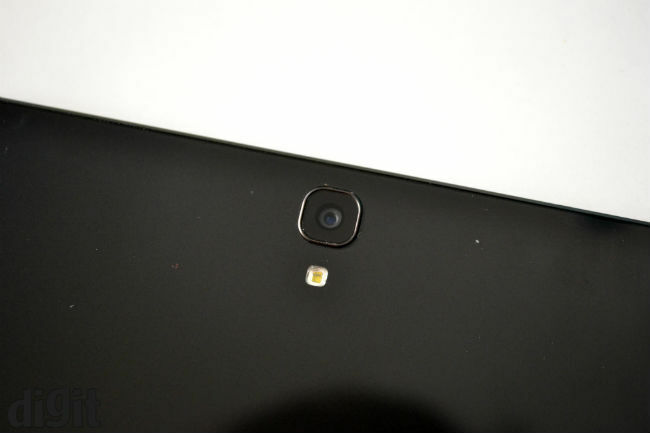 As far as video calling is concerned, both the front and rear camera perform very well. Just like the Note Phablet family from Samsung, the Tab S3 comes with a stylus. One of the coolest features of the Stylus is the ability to take notes without switching on the tablet. 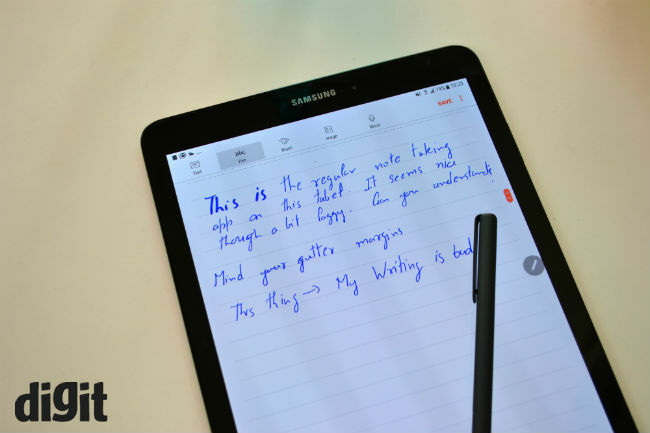 Just double tap the button on the pen and you have the ability to take notes on the display and then save them. The size of the display is not the limit for the notes. If you’ve filled the screen, press the arrow in the bottom right corner and you have a new page to continue taking notes. 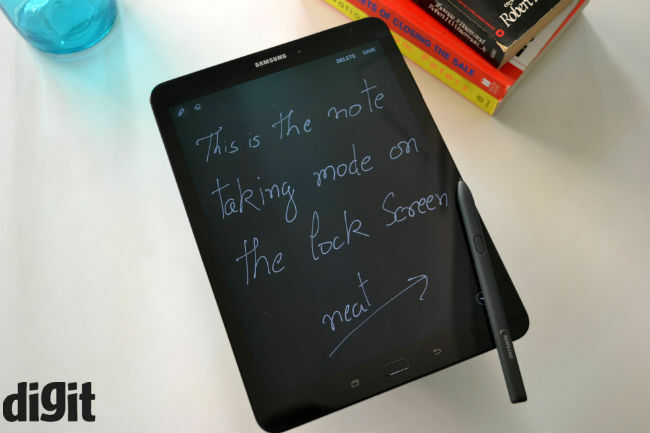 You have a bunch of S-Pen specific apps, including notes, smart select, screen write, and translate. As far as translate is concerned, if you want to see a word in a different language or want to see what the word is in a different language, launch the app and hover the pen over the word, to see the desired translation. You can also tap to hear the pronunciation. There are some interesting applications for the S-Pen, but unless you have the pen on you all the time, it's going to be tough to reach for it when you need it. This is why a housing for the Pen is a must on such devices. One place where you can exploit the tablet is with gaming. Be it graphically heavy games like Injustice 2, NFS or Asphalt, they all ran extremely well. You can also play local multiplayer games like Othello and Chess etc. and thanks to the big display, they are lots of fun. The Samsung Galaxy Tab S3 has a 6000mAh battery. As far as battery life is concerned, you can get about 11 hours plus of local video playback. Battery life will vary depending on where you're streaming from, but expect 9 hours with ease. Heavy gaming can drain the battery life faster. In the PC mark battery test, the tablet lasted for 9 hours and 4 minutes. If you are one looking to consume a lot of content on the go, play games and maybe get a little work done, then yes, you can consider this device. At Rs. 47,990, this goes up directly against Apple’s iPad Pro. If you are looking for something in the Android ecosystem, then this is the tablet for you. It is a good-looking device with a slim profile, and has a good display for consuming content. 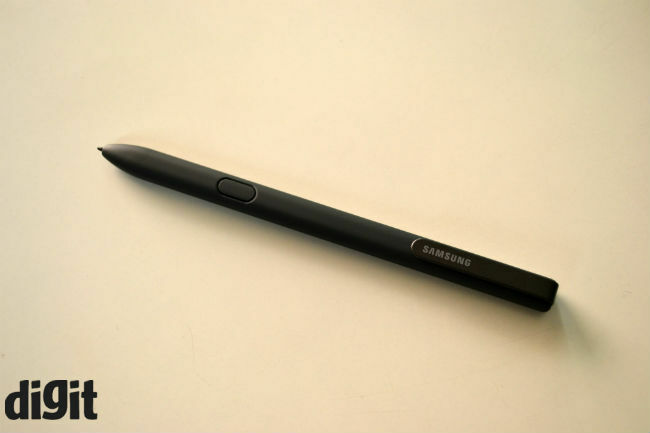 The S-Pen has interesting functionality for those that would like to use it. The only downside are the speakers, that could have been better and the fact that the software was buggy at times. Don’t expect this device to replace your 2-in-1 Windows powered laptop or tablet. Rather, it can complement that devide, thanks to Android's large library of games and entertainment apps. It is a worthy competitor to the iPad Pro.